The GOG BLOG by Rory Spears, Editor and Director of Content of Chicago’s #1 Online Golf News Source.Follow Rory on Facebook, Linkedin, and Twitter @GogBlogGuy. With the Open Belt and Jug at Travel Scotland. When you ask David Connor about Scotland, or golf in Scotland and tell him you have never been there, the first thing he does ask you is,”well why haven’t you been there”. 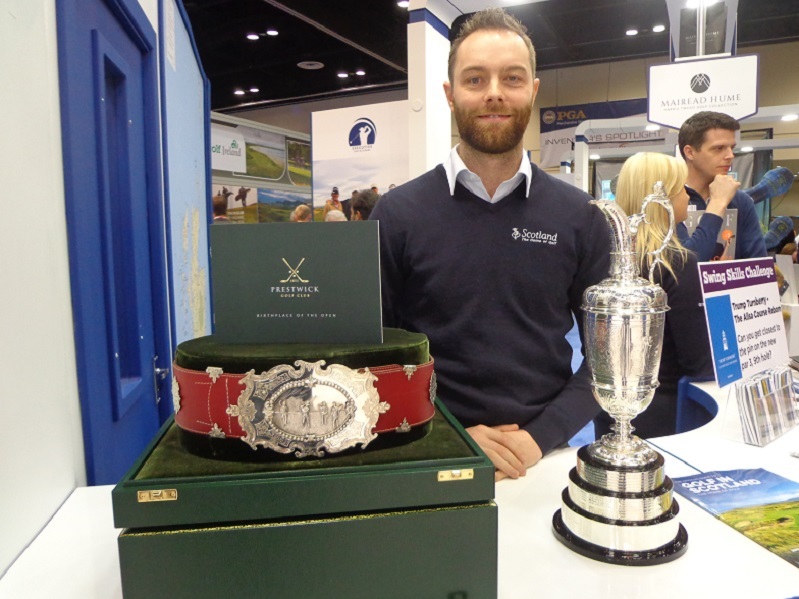 Connor is the Golf PR manager for Visit Scotland and he makes a great point, if you have not been to Scotland and you like golf or love golf, the real question is why have you not been there. 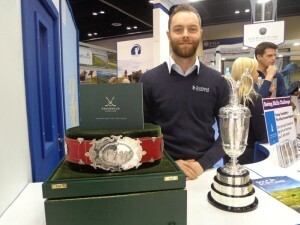 DID YOU KNOW.. the Open Championship in it’s first years did not give the winner a Claret Jug. In fact a belt like the one in the picture above, was given to the winner. 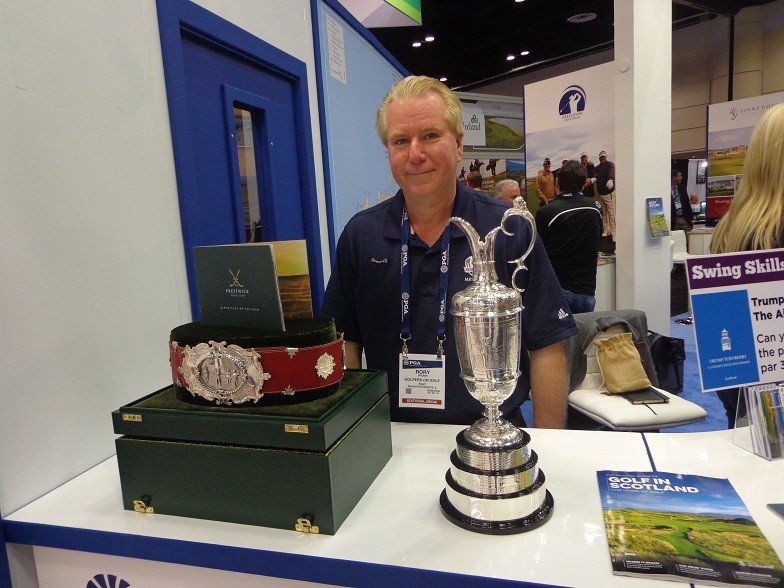 But after “Old” Tom Morris won the “Challenge Belt” three times it was retired and 1 year later the Claret Jug made it’s debut at the “Open Championship”. David Connor the PR manager of Visit Scotland with the Challenge Belt and Claret Jug. This year the jug and the open make it’s way home to Scotland when the championship is played at the Royal Troon Golf Club from July 14-17. Zach Johnson the Iowa native that won the title last year at St. Andrews will be back to defend his title. The week before the Open Championship tee’s off, the Scottish Open will be contested at the Castle Stuart Golf Links from July 7-10. While many golfers know about St. Andrews the birth place of golf, what they don’t know is how many more places there are to golf in Scotland. In fact Scotland has just over 550 golf courses to pick from. Even Donald Trump now has a course in Scotland, named of course after him, Trump International Golf Links of Scotland. The use of the name links is tossed around quite a bit when you talk about golf in Scotland, but the truth is that only 1 in every 5 courses in Scotland are considered to be true links courses. How to approach golf in Scotland. One must consider that weather can always change and even in summer months, not feel exactly like summer. But the best golf season is much like it is some of the northern states in America. However wind or rain can always be a factor. Golf can played differently as well, fast and firm fairways can have golfers hitting the ball much further that they are used to. But when the wind blows you might need a lot more than club than normal. 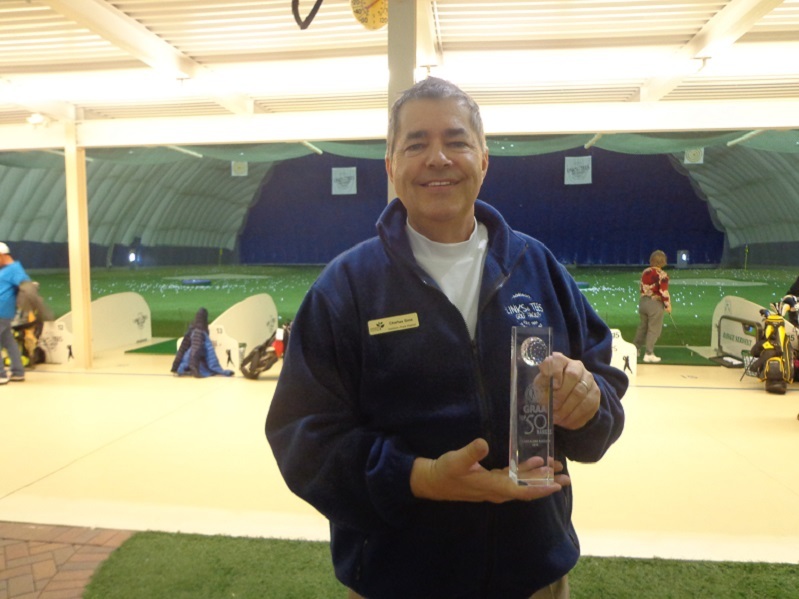 The Chicago Golf Show going on right now and tomorrow at the Donald Stephens Convention Center in Rosemont. Admission is $10 for adults, junior golfers 12 and under are free. How to visit Scotland and deciding where to play can be easier than you think. Connor suggests you break it down by area and stick to it, long travel back and forth across Scotland can be slow. So it’s wise to pick and area and play all the courses in that area. If there are other area’s that you wish to visit, or courses on the other side of the country you want to play, save it for the next trip. Odd’s are you will be glad you did. The area around St. Andrews is loaded with several great courses and it will take you at least full week to enjoy them all. If you wish to visit Scotland this year, start planning and booking right now. Many of the world’s over 60 million serious golfers love to travel to Scotland. Tee times at several courses can be very hard to get unless plan early enough. If you wish to visit Scotland to golf, go to the Open Championship, or just enjoy sightseeing. See Visitscotland.com or to see the corporate website visitscotland.org.